Please click here for race day parking information. 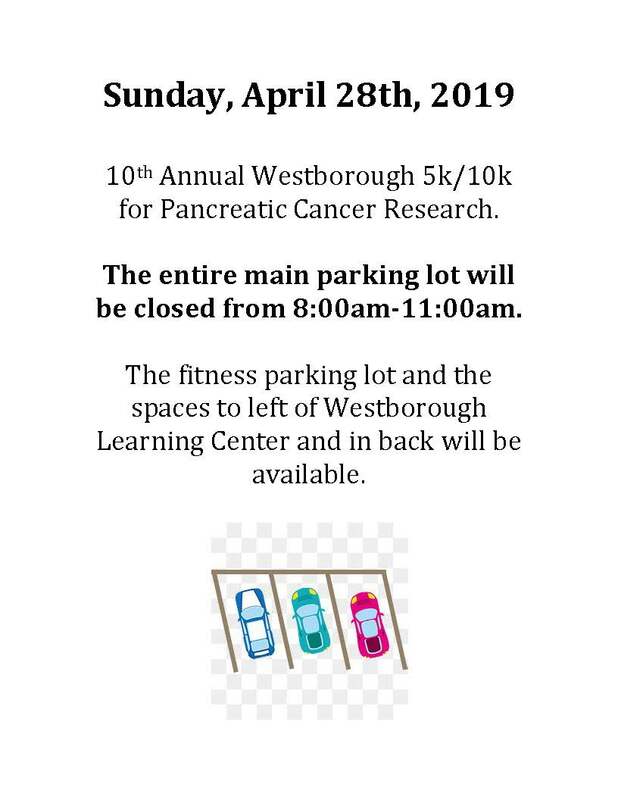 The Westboro Tennis & Swim Club by BSC will be hosting the 10th Annual Westborough 5k/10k for Pancreatic Cancer Research. The row of parking spots closest to building 35B (courts 6 and 7) will be closed off from Friday 4/26 at closing until Monday 4/29 mid day, however, Friday, Saturday and Monday you can drive through. On race day, 4/28 the entire main parking lot will be closed from 8:00am-11:00am. The fitness parking lot and the spaces to the left of the Westborough Learning Center and in back will be available as usual. Please note that Chauncy Street will be closed east of the main Fitness parking lot entrance through Lyman Street between 8:30 – 11am. If you need access to the gym please use Route 9, to Woodman St., to Oak St. (Utilize parking lots listed above).